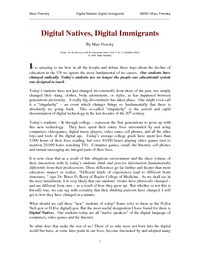 In Digital Natives, Digital Immigrants: Part I, I discussed how the differences between our Digital Native students and their Digital Immigrant teachers lie at the root of a great many of today’s educational problems. I suggested that Digital Natives’ brains are likely physically different as a result of the digital input they received growing up. And I submitted that learning via digital games is one good way to reach Digital Natives in their "native language." The technologist Marc Prensky, for one, has spent much time detailing what he sees as the technology-induced capacity of young people to 'think and process information fundamentally clifferently from their predecessors' (2001, p. l). These claims are grounded in an emerging body of scientific evidence that suggests that young people's working memory and perceptual learning can be enhanced through engagement with digital technologies (see Small and Vorgon 2008). It is argued, for example, that cognitive and neurological benefits are evident in the ease with which childrcn and young people are able to learn at high speed, makc serendipitous conncctions, process visual and dynamic information and learn through digitally-based play and interactions (Prensky 200l). As Prensky (2008, n.p.) speculates, 'within the working lives ofour students, tcchnology will become a billion times more powerful, likely more powerful than the human brain'. The single biggest problem facing education today is that our Digital Immigrant instructors, who speak an outdated language (that of the pre-digital age), are struggling to teach a population that speaks an entirely new language.